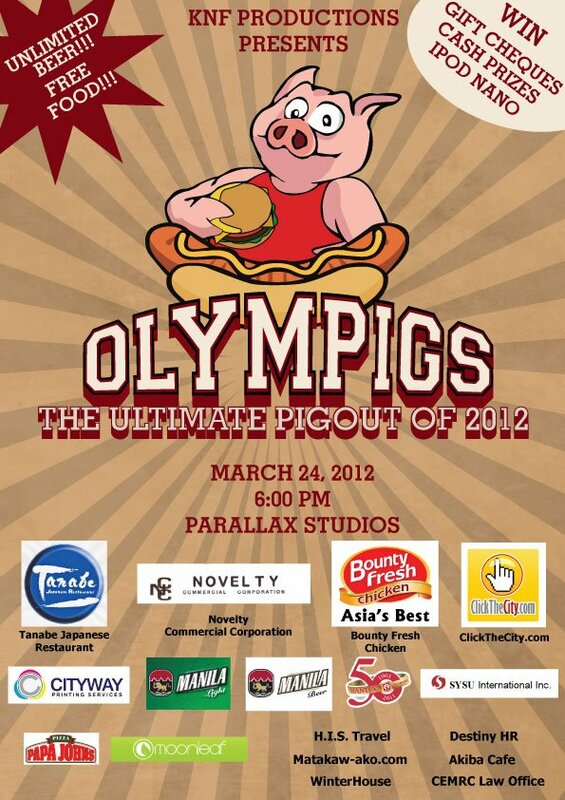 The Food Alphabet and More: Unlimited booze and food at The Olympigs! Happening at the Parallax Studio, 7389 Bakawan Street, San Antonio Village, 1203 Makati, Philippines on March 24, 2012. Great food, fabulous prizes to be won, acoustic performances, games and an unforgettable night of pure fun and food delight! Get your tickets now! Pre-selling at P200, P250 door charge and P150 each for a group of 5! KNF is a group composed of Advertising Management majors from De La Salle University – Manila. Let's support their cause.